Natalie Miller Fellowship Steering Committee is pleased to announce that Harriet Pike has been selected as the 2013 winner of the Natalie Miller Fellowship Award. The official announcement and presentation of the award was made on 20 November 2013 at the annual Screen Producers Association of Australia (SPAA) conference in Melbourne. Established in 2011 in recognition of the unique contribution of Natalie Miller AO, the Fellowship awards a grant of $10,000 to a woman in the Australian screen industry who has demonstrated initiative, entrepreneurship and excellence. All applicants submit a professional development proposal demonstrating how the grant would assist them to reach their full potential. Harriet Pike is a senior producer at Canberra based production company Bearcage. Since joining in 2011 she has produced some intelligent and riveting documentaries; Who We Are – In Sport is a one-hour documentary about some of Australia’s key indigenous sports stars, The Boffin, The Builder and The Bombardier is an half hour documentary supported by eight ten minute interstitials, it’s a fast paced living history program in which three mates deconstruct history by reconstructing the devices that made it and Building Australia, six half hour episodes where John Doyle looks at the nature of the Australian house. Prior to joining Bearcage Harriet had worked as a distributor and producer at Ronin films where she had responsibility for acquisitions, business development and documentary production. Harriet intends to travel to the University of Oxford to attend the intensive High Performance Leadership Programme at the Said Business School with her grant. On receiving her grant Harriet said “I am utterly thrilled and honoured at being this year’s recipient of the Natalie Miller Fellowship. The opportunity for me to receive the executive level leadership training will support both my career goals and my aspirations for the future of the Australian film and television sector to which I am deeply committed. In addition to seeing more women in executive level positions I also believe we can learn a lot about leadership and innovation by looking at other industries which is in part what I hope to gain from the Oxford programme”. This year’s applicants came from all major Australian states and were assessed by a selection panel of 4 highly respected and distinguished screen professionals from across several sectors of the industry. 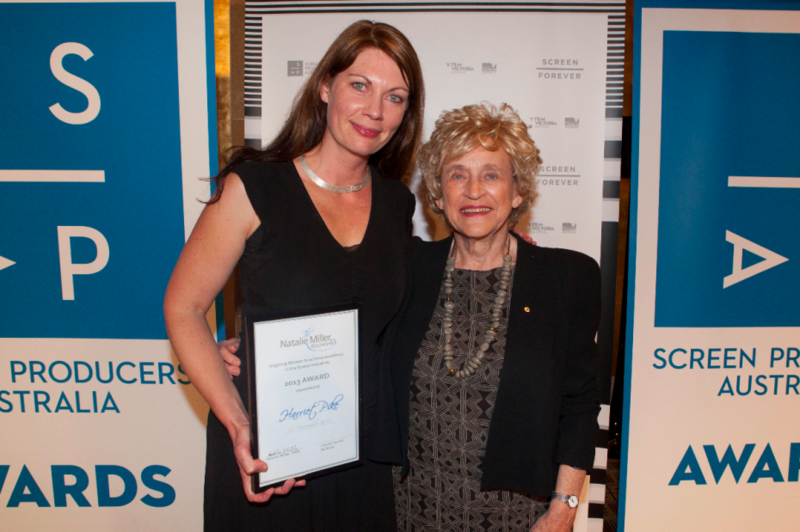 The inaugural Natalie Miller Fellowship Award was presented to Rachel Okine last year. She used the award to attend the Harvard Business School Women’s Leadership Forum: Innovation Strategies for a Changing World.